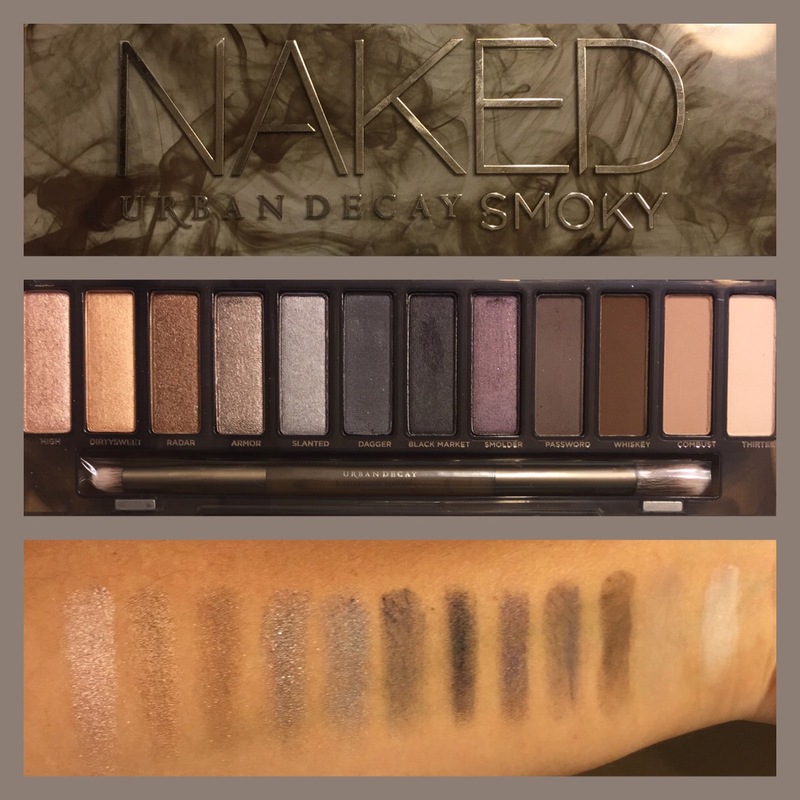 Urban Decay Naked Smoky – Take it or Leave it? Let me start off by saying that I am a huge fan of Urban Decay eyeshadows. I own all of the full sized Naked palettes and I have loved them all. I own several eyeshadows from several different ranges, but the Naked palettes are what I reach for probably 98% of the time. They are gorgeous, go on beautifully both wet and dry, and I find them extremely wearable. So naturally when I found out that they were releasing a new Naked – the Naked Smoky – I knew I wanted a piece of that! Joe and I went into Sephora and I was on the lookout. I honestly thought they would be sold out as it was so soon after launch, so my plan was to drool over the display and harass the staff about when they would be getting more stock. It was a pleasant surprise when Joe came up to me and said: “it’s here…it’s over there.” I went over to find a display with quite a few available. It took me about 1.6 seconds to decide to buy it. I knew I was going to get it sooner or later anyway, so why not just get it over with? So what do I think of Urban Decay’s latest? The first thing I absolutely have to mention is the packaging. It is absolutely gorgeous. Urban Decay’s packaging gets a little better with each new palette. This packaging is a reflection of its name; it is a semi-transparent plastic that has a smoky look. It has a magnetic closure that in my opinion is far superior to the snap closure of the two previous palettes, and it is better than the magnetic closure of the original Naked. The shadows are beautiful. They are the same almost creamy consistency that Urban Decay is known for. The first 5 shades going from left to right are shimmery shades (High, Dirtysweet, Radar, Armor and Slanted). This is followed by two dark grey/black shades (Dagger and Black Market), great for lining and to smudge up for a smoky eye. This is followed by a dark purple shade (Smolder). The last four colours are matte shades (Password, Whiskey, Combust and Thirteen) the final two being highlight shades. I think the shades are all very wearable, and let you go from a very natural to a very dramatic smoky eye. The shimmery shades in particular are very pretty, and go on very nice wet. The colours are all very buildable, so you can go as light or as dark as you’re feeling, depending on the occasion. The palette comes with a lookbook that serves as a guide to four different smoky eye looks. It’s a good place to start, especially if you’re a bit intimidated by the smoky eye look. Verdict: Take it of course! Especially if you’re already a fan of the Naked palettes, you’ll definitely want to add it to your collection. Honestly, the Naked 3 is still my all time favourite and most used, but the Naked Smoky is a wonderful addition and I highly recommend it. The Naked Smoky retails for $64.00 and can be purchased at Sephora and at select Shoppers Drug Marts. As I talked about in my last post, I am really going to try to add content to this blog more often. I also mentioned that I was thinking about expanding the focus a little. For anyone that reads this regularly – I’m sure there are one or two of you (Hi Mom!) – you know that this space has never been about just one thing. It’s more of a reflection of who I am, with lots of emphasis on my likes (reading, cooking, my own opinion). I mentioned a couple of posts ago, that I have a newfound obsession with YouTube. This of course has been fueled by my obsession with beauty products. Bath, body, face, hair, makeup – you name it, I am interested in it. I love reading about it, watching videos about it, shopping for it, etc. So I figured that if I was going to stay true to the nature of this blog, that maybe I should open it up a bit to that side of my personality as well. I should probably get this part out of the way – I am by no means and don’t claim to be a beauty expert, just extremely interested in it, excited about it, and eager to learn more about it. I love to watch YouTube “Monthly Favourites” videos where all the beauty bloggers and vloggers talk about the new things that they have discovered that month and what they are loving and recommending to their viewers. I thought maybe I could do a little of that here. I do not upload videos to YouTube (aside from a few silly ones) and have no plans to start. I also have no plans to turn this into a “beauty blog.” There are plenty of those out there written by people much more knowledgeable than me. I guess I just thought that if the inspiration hit me, or if I tried a new product that I was loving, or re-discovered an old product, I could let you know about it. Hopefully that appeals to you. If it doesn’t, don’t worry, because next week there will likely be a recipe or a book review or an opinion piece. Just as there are many different parts of my personality, there are many things to write about here. To start I guess I’ll just mention the gorgeous eyeshadow palette in the picture above. This is a pretty popular one, the Lorac Pro Palette. It used to be available at Sephora, but no longer is. It is hard to get your hands on in Canada unless you want to pay an arm and a leg for it. I actually had my wonderful cousin that lives in Arizona buy it and ship it up for me. If you live in the US, you can buy it at Ulta, or from Amazon. It retails for $42 US, and I have wanted this beauty for a long time. I was not at all disappointed. This palette comes with 16 gorgeous shades – 8 matte shades in the top row, and 8 shimmery shades in the bottom row. The shades range from white to black and stick mostly to the neutral tones, but there is a very nice blue, a purple, and a beautiful coppery shade, along with a couple gold/bronze toned ones. The shadows are almost creamy in consistency, though they are definitely powder, and they are nicely pigmented – a little goes a very long way. If you are a beginner at makeup, or simply someone that wants to expand their collection, I would totally recommend this palette. It really has everything you need to create several looks, from light and natural to dark and smoky. This one for me was definitely worth the wait! Hope you’re all having a great day and the sun is shining wherever you are!